I make a delicious gluten-free pizza, while my husband gets his pizza toppings on a piece of bread. OK, it was naan bread, and he said it was good, but it was significantly smaller than mine, and it didn’t look as delicious as what I had that night for dinner. Here is the recipe, in case you want to try it out. 2 pizza crusts – I used cup 4 cup gluten-free pizza crust mix. If making your own crust or using a pre-made one, follow baking/heating directions. Slice the onion thin and caramelize by sauteing on low heat with a little olive oil, stirring often to release juices and being careful not to burn the onion. The onion is ready when it is brown, very soft, aromatic and very sweet to the taste. While the onion is caramelizing wash the arugula thoroughly and pat dry. Dress with olive oil, salt and pepper and set aside. Slice the tomato thin, set aside, and start assembling the pizzas by brushing olive oil on them and seasoning with salt and pepper. Arrange the tomato slices around the crusts, covering them as much as you can. Add the onions, and then the goat cheese in small pieces (I do this using two teaspoons) Season with salt and pepper. Cover the pizza with the parmesan cheese, and bake until crust is golden and cheese melted. 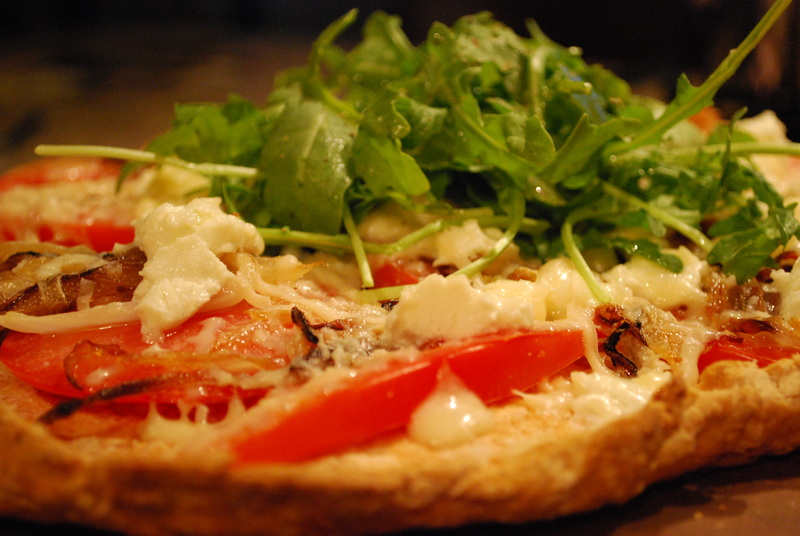 Pull from the oven and top the middle of each pizza with the arugula salad you’ve set aside.